and Moosehead Lake, Greenville, Maine! We have been serving the region’s wilderness flying needs since the early 1980s in these great airplanes of a by-gone era. Our fleet of aircraft presently include a 1954 deHavilland Beaver (famous in Canada and Alaska), several rare Cessna 195s (perhaps the only 2 commercially operated in the U.S.), and several Cessna 180s, all maintained to the high standards of our F.A.A. Air Taxi certificate, which gives us unlimited access to this vast region of magnificent scenery. 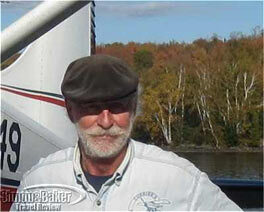 Learn more about our vintage seaplanes and Roger Currier, director of operations and maintenance.